Like most cruisers, we feel like a kid on Christmas whenever we get to step foot on a brand new ship. Every new restaurant and entertainment venue is like a present waiting to be unwrapped, and when Princess Cruises' launched Regal Princess, there was no shortage of gifts under the tree. Join us as we explore the most popular restaurants, entertainment, and cabins aboard Regal Princess. After scouring the ship from top to bottom we found the best dining and activities on Regal Princess. Watch your food get made at Horizon Court with live action cooking stations, stop by Crown Grill for premium seafood, then have a drink at the nautically themed Wheelhouse Bar. Once you've satisfied your hunger, stroll through the Piazza, a 3-deck atrium with bars, lounges, and live entertainment, or stop in to Princess Live, a full TV studio with interactive culinary shows, live concerts, late-night comedy, and game shows. Finish your night by grabbing drinks at the glass-bottomed bar SeaView, then watch a dazzling light show as the pool deck's dancing fountains shoot illuminated water over 30 feet into the air. Like most new cruise ships, Regal Princess has over 30 cabin categories to choose from. Sure, researching that many cabin types isn't easy, but it does mean you can always find a cabin that's perfect for your needs and budget. We'll walk you through the most popular cabin types: modest (but frugal) inside cabins, balconies and ocean views with a little extra space and fresh air, plus luxurious penthouse suites for travelers who like to splurge. 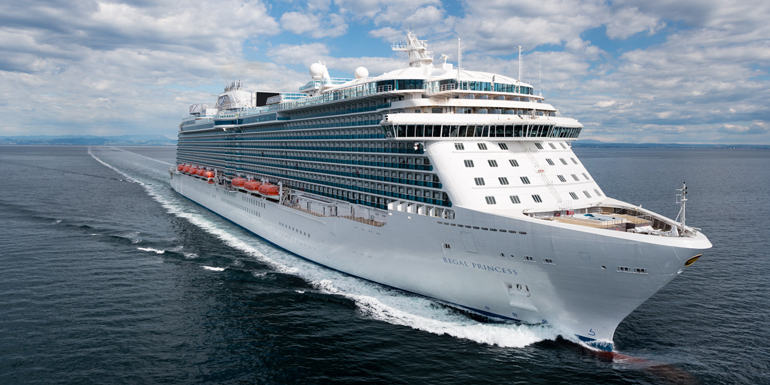 What's feature on Regal Princess are you most excited about?